stormy here in Virginia Beach... very strange for February. Missouri got hammered pretty badly by tornadoes recently, please send them prayers and good energy! 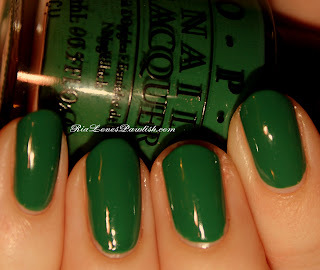 today's polish is OPI Jade Is The New Black, a warm green cream. it's definitely the greenest polish i own, it's WAY more warm green than it looks in the bottle... bottle color looks almost teal! the only jade i own is much more yellow toned than this color is, but i know jade comes in loads of different varieties so that's not a good litmus! the formula was okay, opaque in two coats. my complaint is that it wanted to be patchy, and yet at the same time it was thick and gloopy. the color is gorgeous, though, and it does even out by itself if you leave it for a couple minutes after the second coat. after adding Seche Vite, it's worth the extra effort! one coat Seche Base, two coats JITNB, one coat SV. I love this shade!! I've picked it up and put it down so many times. I really should just get it already.